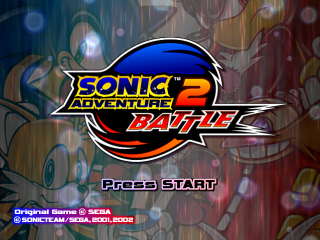 Sonic Adventure 2: Battle (ソニックアドベンチャー2 バトル) is an upgraded port of the Sega Dreamcast's Sonic Adventure 2 for the Nintendo GameCube. It was the first Sonic game to be released on a Nintendo console. Ironically, this version of the game did not get as good reviews as its Dreamcast predecessor. The 2P versus mode is considered the biggest change between the Dreamcast and the remake. It is most likely the inspiration of the term "Battle" that is added to the title. The 2P menu was completely redesigned with a different background tune. The players no longer have to choose a group making it possible for characters to face off against characters in their own alignment. Example: Sonic can now fight against Amy Rose. All characters that needed to be unlocked with an A rank with specific characters are now available from the start. Moreover, they were each given special stats that made each of them unique instead of just being clones of the main characters. For example, Chaos who had the same speed as Rouge in the original now has become much slower. Each character also received their own unique special attacks. Metal Sonic's attacks were completely removed and replaced with the ability to activate the Black Shield which defends against special attacks. The playing system was altered so that players are no longer required to play 3 stages in a row. More stages were made playable, such as City Escape and Dry Lagoon. Dry Lagoon was also redesigned in 2 player mode to take place at night. Also, special races were added such as the grind race and the shooting races. An option menu was added. In it, the player can set a handicap, remove or enable a time limit, or set the traditional rules of VS mode from the Dreamcast. A new character was added, Dark Chao and its walker, in the place of Big the Cat. The secret character skins were also changed both in appearance and how they are obtained. During Knuckles and Rouge's stages, a red exclamation point will appear when a player is right on top of an emerald/key. In Tails and Dr. Eggman's stages, it used to be possible for their machines to receive damage even with a barrier shield. This was taken away in this version of the game. Some sound effects were added during gameplay, such as the sound that is made just before the GUN Hornets fire their bombs. Since the game is run by a faster processor than its predecessor, the game does not slow down during hectic situations. Some stages were also slightly modified either gameplay wise or graphically. Some gameplay changes can make a level easier or harder. In the Cosmic Wall stage, the A rank scores were raised significantly in the GameCube version (1st mission 53,000 -> 80,000; 4th mission 45,000 -> 75,000; last mission 50,000 -> 100,000). The Crazy Gadget stage received the most infamous graphic change. The green "X"'s on the small boxes where changed to red "X"s most likely because it looked too similar to the logo of Nintendo's rival system, Xbox. Tails' and Eggman's lock-on laser is now able to mark targets at a faster rate (once every 8 frames on GameCube, whereas it takes 12 frames to mark each target in Dreamcast). Their Volkan Cannon is also able to achieve a faster rate of fire by a similar margin. The first frame of Knuckles' Spiral Upper attack, and Rouge's Screw Kick, has roughly double the reach on Dreamcast. This was removed in the remake, leaving it with only the same reach as the rest of the move. Additionally, a few more objects were given immunity to those moves, most notably the safes around the perimeter of Security Hall. Kart Racing was given more features. By completing all of the characters' missions, a secret kart could be unlocked for each one with more advanced stats. Sonic's secret kart is actually the same kart that was available on the downloadable High-Speed Trial Kart Racing from the Dreamcast. The Eggrobo that was also downloadable on the Dreamcast could be unlocked after completing all of Rouge's missions. Chao also becomes a selectable racer in this game after completing Tails' missions. The main characters received slight modifications and better shading. Their shadows also became more detailed. Camera angles are changed or improved. A special background was added when a character would use a special attack. Objects that were transparent, such as the balloons and the Artificial Chaos, were made solid. Many light effects such as the flashing red lights in Iron Gate and the flashing green lights in Egg Quarters were removed or made simpler. Much of the text on Tails and Eggman's walkers are removed. Including Eggman's insignia that was on the back of his walker. The GUN robots also had a downgrade in appearance. The glistening effect that the Beetles had was removed. Also, the exhaust flames on the backs of some of the robots were also removed. The Shield Hunter's shields changed in appearance given a darker shade of red and becoming much narrower. Rouge's Pick Nails are not visible on her boots like they are in the Dreamcast version. Cut scenes load much faster than their Dreamcast counterparts. Some details for non-playable characters, such as Amy's teeth and Maria's eyelashes, were removed in the remake for some reason. In the first scene of the Hero story, the angles of Sonic exiting the helicopter are altered. Also, in the Dreamcast Version Sonic is seen with his original shoes on then changes into his Soap shoes once he jumps from the helicopter. In this version, Sonic has his Soaps on the entire time. In the scene before Knuckles enters the Death Chamber, the Eggman signs from Pyramid Cave that were visible in the background were removed. Furthermore, the camera angle on Sonic during the last moments of the scene was changed entirely. In the scene where Rouge finds out about Project Shadow, the screen she is looking at is noticeably different. The Dreamcast shows the screen displaying a picture with the Biolizard while the remake just shows the screen flashing "DANGER". The screen is also changed to display Sonic, Tails, and Amy in the ARK rather than showing that the Chaos Emerald is near. Some sound effects were added or changed. Notably, in the cut scene where Shadow figures out Rouge's true intentions, the Dreamcast version plays her theme song throughout the entire scene. However the GameCube version changed it so that it would cut from Rouge's theme song and then go to Shadow's theme song. The Chao World was also drastically changed. Omochao no longer appears at the gate to greet you. The Chao's stats that could only be viewed via the VMU can now be viewed in the game itself. Items that needed to be imported from Chao Adventure 2, such as seeds, can now be bought at the black market. The Chao Doctor gives a full report of your Chao's personality and favorite food. The VMU port was replaced with a GameBoy Advance port. It can be used to transport Chao to the Tiny Chao Garden on Sonic Advance or Sonic Advance 2. They can also be transported to Sonic Pinball Party. In addition to importing Chao to the GBA, the port can also be used to release Chao or move them to another memory card. The background music for the Chao Lobby was changed and replaced with the Chao Race Entrance music in Sonic Adventure. The music used for the Dreamcast version was used for the Chao Cave instead. Also, the Chao Race entrance background music changed. The music used for the Dreamcast version was used for the Game Boy Advance port instead. The layouts of all three Chao gardens were changed. The river that was in the Hero Garden and the cave that was in the Dark Garden were all removed. The Tiny Chao Garden minigame can be downloaded from the game to a GBA. The characters attacks were removed to prevent the player from accidentally hitting their Chao. Though, Sonic can still use the Bounce Attack while Tails, Eggman, Knuckles, and Rouge's attacks can still be selected via the mini menu. An opening sequence which the Dreamcast notably lacked is added just before the title screen. The title screen that used to be just of Sonic and Shadow now includes all characters. This is also true for the default menu theme. The menu themes of the playable that needed to be downloaded via the internet are available by default. This also includes the Shadow theme that was never released in America. The Omochao, Amy, and Maria theme can be bought at the Black Market in Chao World after collecting a certain amount of emblems. The Sound Test was moved from the Options menu to the Extras menu. Big's stage cameos were removed, and in some cases replaced with rings. Though, Big will make cameos in the cut scenes if the button is pressed rapidly. 1,440,000 Nintendo Gamecube US The Magic Box - US Platinum Videogame Chart Due to the lack of available sales data for the original Dreamcast release (as it was released a few months after Sega discontinued production of the console), this reference provide the only sales data available for any release of Sonic Adventure 2. Omochao's tutorial still shows the same screenshots from the Dreamcast version, which showed a blue button in contrast to the GameCube's red one. This page was last edited on 17 March 2019, at 13:35.